I upgraded my database a couple of weeks ago and now my users complain their application is slower. They do not provide specifics but they “feel” it is running slower. Sounds familiar? It is very hard to deal with the ambiguities of some problems like “finding SQL that performs worse or better over time”. But if you simplify the problem and consider for example “Elapsed Time per Execution”, then you can easily produce a script like the one below, which returns a small list of SQL statements that seem to experience either a regression or an improvement over time. It uses linear regression on the ratio between “Elapsed Time per Execution” and its Median per SQL. Then, If you are suspecting you have some SQL that may have regressed and need a hand to identify them, you can try this script below. It is now part of a small collection of scripts that you can download and use for free out of the cscripts link on the right hand side of this page, under “Downloads”. --              are considered "improving" while negative are "regressing". --              Requires an Oracle Diagnostics Pack License since AWR data is accessed. 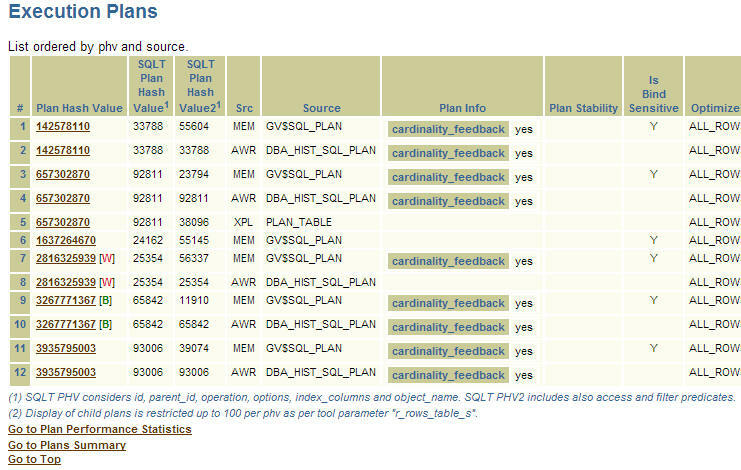 --              (or planx.sql or sqlmon.sql or sqlash.sql). AND CAST(s.end_interval_time AS DATE) > SYSDATE - &&days_of_history_accessed. AND MAX(days_ago) - MIN(days_ago) >= &&captured_at_least_x_days_apart. HAVING ABS(REGR_SLOPE(t.time_per_exec_over_med, t.days_ago)) > &&min_slope_threshold. --              improvement or regressed over some History.